(Estancia mínima 6 noches) Bienvenido a 1175 Sleeping Child Road. Esta impresionante casa de 7000 pies cuadrados es una de 5 dormitorios, 4 1/2 baños, área de estar de 4,572 pies cuadrados, con 2000 pies cuadrados de terraza cubierta y patio con estructura de madera y un garaje para 3 autos, todo enclavado a lo largo del río Bitter Root. Observación de la fauna y la pesca desde su patio trasero! 3. 1 Acres línea 1000 pies a lo largo del borde del río Bitter Root. Entrando por la puerta de entrada, verás la araña de hierro de diseño personalizado en el porche delantero. La sala de estar ubicada en la planta principal cuenta con ventanas grandes y puertas francesas que conducen al porche cubierto de la planta superior, que ofrece vistas increíbles del río y las montañas a lo lejos. Abundante vida silvestre frecuenta la propiedad, así como águilas que vuelan arriba y abajo del río. Esta propiedad está ubicada a lo largo de una sección del río Bitter Root, justo debajo de la diversión, que le permite ingresar al río desde la propiedad y flotar río abajo hasta la ciudad sin obstrucción. La propiedad tiene una entrada inclinada hacia el río para facilitar el acceso al agua. La cocina incluye electrodomésticos de acero inoxidable, desayunador, snack bar y amplio comedor. A continuación se encuentra el dormitorio principal que contiene espectaculares techos abovedados, 2 salidas al porche, baño principal con una gran ducha de azulejos, dos tocadores separados y mostrador de maquillaje. El área baja del porche a lo largo del río tiene un área de porche cubierto de 900 pies cuadrados para entretener u organizar eventos más grandes. ¡Esto es una propiedad única! We brought our large family to the Bitterrot Valley to enjoy skiing and hiking in the Bitterrot Mountains. We enjoy the Valley during the winter so our needs for a home are slightly different than in the summertime. We bring a lot of ski gear that will be exposed to snowy conditions and will be wet upon our return to the house. We will be chilled from spending long hours on the trail either hiking or snowmobiling. Spacious rooms that heat up quickly are two of the requirements we look for in a rental house. Secondarily, we like to be out of town but close enough to drive in for evening activities. Jeff Lee’s house satisfied all our requirements while adding tasteful decorations and sturdy useful furniture. The pool table provided opportunities for our large group to be together sharing a single activity, but when one sought a quiet space, there were plenty of options. The house is situated on the banks of the beautiful Bitterroot river which is made even more so when snow is falling and Bald Eagles fly along the banks searching for food. It is a very short 5 minute drive into Hamilton and just 15 min to Darby. All in all, we couldn’t have been happier with our rental experience, Jeff made sure we were comfortable and our needs were cared for. Therefore, we fully recommend this property for your next visit to the Bitterroot Valley. It is a very nice place, well appointed. It has a beautiful setting on the river. There were five of us staying there with a bedroom for each of us. Everyone found it to be very comfortable and equipped with everything needed for our stay. It is a very nice place. This property is fabulous. The house itself is great. Bedrooms are large with bathrooms for almost every room. Beds are comfortable with plenty of towels for use. 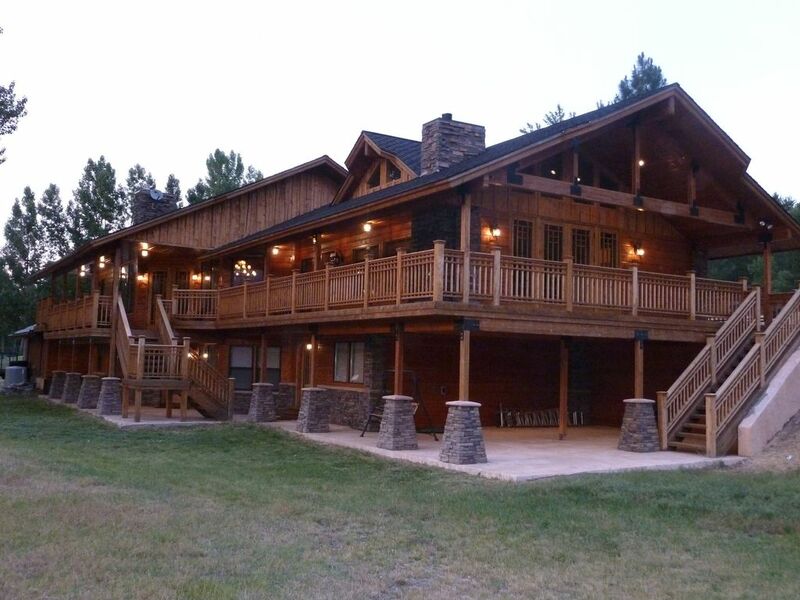 The house sits right on river with great access to fishing right in front of you. We were out fishing there everyday. We saw lots of turkey, geese, and deer. Elk were bugling right next to the water. The house manager is very responsive in case you have any needs which we didn't as things were all great! Hamilton is a cute town with access to about everything you might need. I would encourage a ride off 93 down main street to see there quaint shops and farmers market! Lots to do close by and several rivers a short drive away for fishing! My favorite spot was their two hammock swings that are on the river bank. Swaying and listening to the water with float boats passing once in awhile was so relaxing! We will definitely be back! A beautiful home in a great location! The property was everything we expected and more. The owner was very gracious and interested in making sure our stay was comfortable and enjoyable. The location was outstanding, easy to get to and not too far (but far enough!) from town. The home was beautiful inside and out, nicely appointed furnishings, kitchen with all the utensils we needed and more, plenty of bathrooms, lots of extra towels and bed linens, comfortable beds in spacious rooms, very comfortable living room upstairs (with gas fireplace), very nice downstairs family room. The outside space is very relaxing, lots of comfortable chairs and outstanding views. During our 7-day stay we had 13 different people overnight with us and all were amazed by this beautiful property and the tremendous value. Never felt crowded but the space is warm and comfortable for larger crowds. Easily accommodates 5 couples and there is also equipment for small children, extra beds for overflows if necessary. Access to the river is excellent. Would HIGHLY recommend this property. Wish we could have spent a month there, lots to do in the surrounding area. We'll definitely bookmark this for a future getaway. My wife and I hosted our 6 grandkids - 8,9,11,12,13 and 20. The house could not have accommodated them better. The size and layout of the home allowed everyone ample space to be together, as well as find some down time. The float from the house down the river on supplied large river tubes was great. As was the fishing and horseback riding. Will certainly return next year. Well stocked kitchen and very comfortable beds, etc. Hamilton es el prefecto pueblo de Montana. Tiene casi todas las comodidades que necesitará. Numerosos restaurantes y tiendas de comestibles, cines, ferreterías, tiendas, concesionarios de autos, mercados de fin de semana, abundancia de actividades al aire libre. Esquí de nieve a menos de 1 hora de distancia. El aeropuerto internacional de Missoula está a solo 1 hora de distancia. La Cordillera de Bitterroot con picos nevados es la vista del telón de fondo mientras observas el río Bitterroot. Pesca de trucha excepcional en su puerta trasera. Muchas guías locales a solo unos minutos de distancia. Este es mi lugar favorito en Montana!